There’s one helluva tour headed to the Northeastern United States. 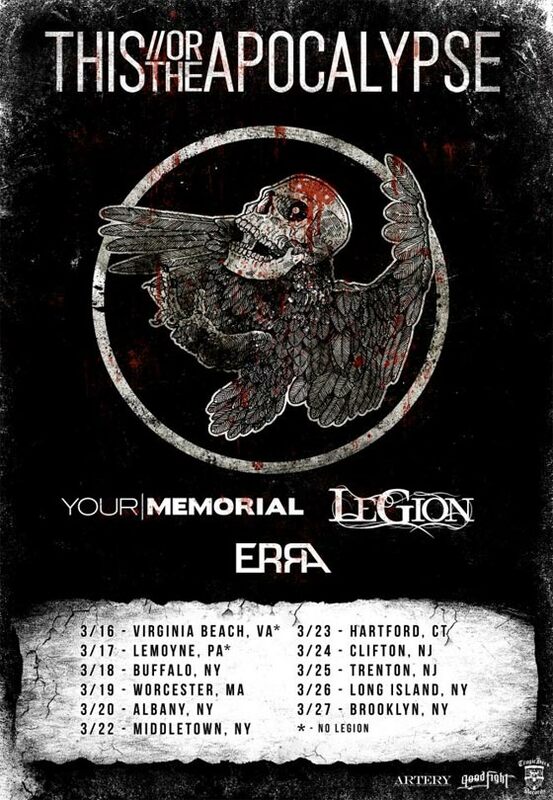 Reaching from Virginia to Connecticut, This Or The Apocalypse will be going on a live rampage along with Your Memorial, Legion, and ERRA! Ohhhh yeeeeah. Every band has something huge to offer audiences. These shows will most likely leave venues in shambles. Hope they have insurance! You can check the dates on the flyer down below along with music from all the bands. Grab those tickets! We’ll see you in the pit. Also, if you haven’t heard, TOTA are in need of a new touring van. Help a brother out and pitch in here. Let’s get this show on the road!